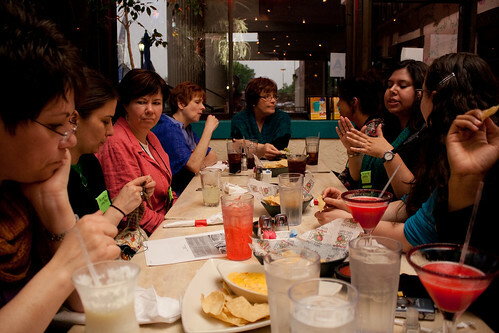 I was fortunate enough to be able to attend the Spring Fling hosted by The Loopy Ewe. From the time I arrived, to the time I left, I had a fantastic time! It was so much fun to meet the folks I’d been chatting with and getting to know on Ravelry through the Spring Fling group (or elsewhere on Ravelry), Plurk, and Twitter. I posted pictures on Flickr, here, but here are a few of my favorites with the recap. I left the house at about 8 am and on the way to St. Louis, I picked up Lana. It was nice to not have do do the whole drive solo. I met her at a local yarn shop, then we had lunch and headed on our way. We made it to St. Louis around 3:30 pm (EST, so really 2:30 pm St. Louis time) and got settled in. At check in we got our Swag Bag. 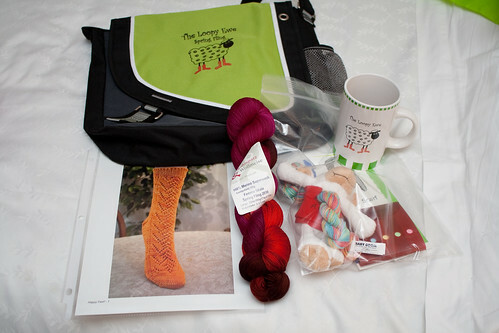 The Swag Bag included: a messenger bag, Little Loopy, TLE mug, Wollmeise in a special Fling colorway, TLE stitch marker, sample of Baby Boom, a Wendy sock pattern, a scarf pattern, and a little book of various sized sticky notes. The first night a large group of us enjoyed dinner at Casa Gallardo, which was organized by the fabulous Jen. As I expected, the service was a bit slow with such a large group, but it wasn’t a problem since I was in the company of fellow fiber folks! After the dinner was the desert reception. I did take a few pictures, but they all ended up quite blurry. I got to meet my roomie, Lauren (who was great to room and hang out with!) at the desert reception since she got in a little later in the day. Friday I had the morning free to hang out and knit. I got to meet Stacy (of Tempted Yarns) and the Gray Ladies during my morning free. They are so fun to hang out with! 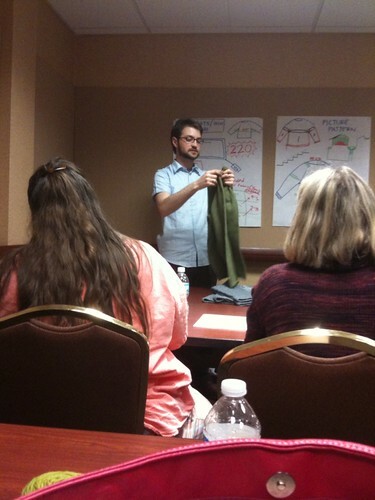 In the afternoon I had Jared Flood’s sweater class. 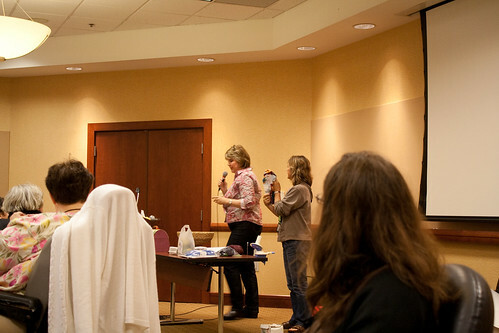 The class was fantastic and gave me a whole new love and desire to knit sweaters. I’m already planning on what to make next! On Friday night I had dinner at The Drunken Fish with Lauren and I can’t for the life of me remember who else. Typically sushi isn’t my first pick, but the last few times I’ve gone to sushi restaurants, I’ve really enjoyed it, so I gave it a chance. I had a Fried Philly Roll, which was really, really tasty. So good that we (Lauren and I) went again on Saturday night! (It helped that the second time we had coupons and got some happy hour specials.) Friday evening was pretty relaxing and it was great hanging out, knitting and chatting with people. 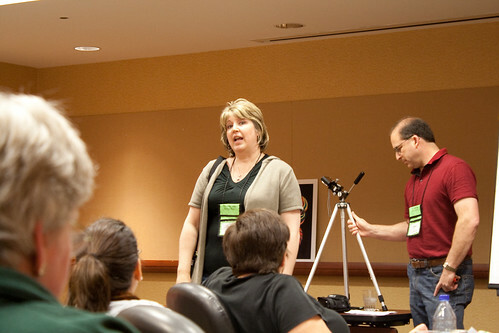 At 9 pm there was a breakout session on photographing yarn with Sheri’s husband. I thought there were a lot of helpful tips, but personally they were mostly things I already knew (however it did seem that many people got a lot out of it and I’m aware that I know more then most). Saturday I had the morning free. I sat and knit with Leslie and Laura of The Knit Girllls in the morning and they are as much fun as they are in their videocast. The afternoon was spent at…. LOOPY CENTRAL!! Many previous Flingers warned that it’s a bit overwhelming and when I arrived, it definitely was. 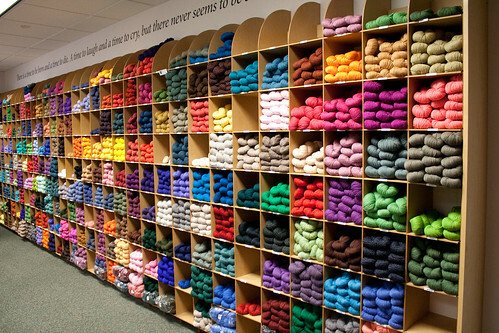 So much pretty yarn I didn’t know where to start! 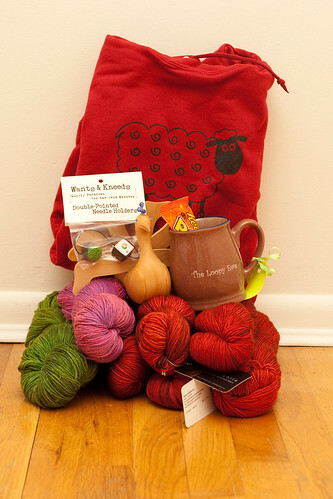 There was even some Bugga and sock kits from last years club (and the first shipment of this years sock club). I decided not to get any of the kits or Bugga, but I didn’t come away empty handed by any means. I bought five skeins of Fiberphile Merino Cashmere Sock in Turkey Hill (for a sweater), one skein of DIC Starry in Happy Forrest and one in Punky Fuchsia (for the Daybreak shawl), a sock blocker peacock, DPN sushi holders from Wants & Kneeds, and TLE red sweatshirt. The mug was a gift you received when you went to TLE. After the group photo, there was the Vesper photo. 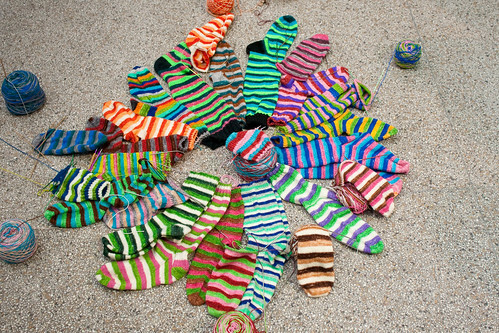 A thread was started on the Spring Fling board about Vesper and suggested that we get as many people going to the fling as possible to knit a pair of Vesper socks and then take a picture of all of them together. Saturday evening was the door prize drawing with Sheri and one of the Loopy Elves. I didn’t win anything, but it was fun! 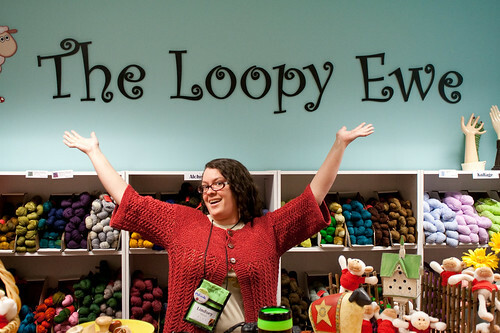 We also got to hear some upcoming things happening at The Loopy Ewe (which Sheri has email about, but we got to hear it first). Once the drawings and announcements were done, a group of Flingers got up to sing the Spring Fling song, which was written by Tammy. You can see and hear the whole song here. Sunday morning it was breakfast then back on the road to head home. As always, wonderful events like this end too soon and seem too short! I had such an amazing and wonderful time. I’m so very glad I got to go this year and meet such fantastic people. I hope I can attend next year! Wow you really did some searching to find a link for the Gray Ladies, they will be so excited about being included to your post. It was a wonderful weekend and wish I had gotten to spend more time with you, what a whirlwind. Look at all that Vesper! Love it! I’ve thought about trying to go to spring fling sometime but I have a hard time wanting to swing the cost of airfare. It was so great to meet you in person! It was so great meeting you at the fling! Hope to see you again next year! i haz a huge jealous! !